Item description: Dispatch, dated 4 June 1864, from Robert E. Lee to Richard H. Anderson, written during the Battle of Cold Harbor. Item Citation: From the Edward Porter Alexander Papers #00007, Southern Historical Collection, Wilson Library, University of North Carolina at Chapel Hill. I apprehend from the quietude the enemy has preserved today that he is preparing to leave us tonight, and I fear will cross the Chickahominy. In that event the best course for us to preserve in my opinion, would be to move down and attack him with our whole force provided we could catch him in the act of crossing. I wish you would keep your pickets on the alert tonight and endeavor to detect any movement in your front, and should you discover that he is abandoning his position be prepared to move your whole corps on the direct road from Gaines’ Mill by Parker’s Mill towards Dispatch Station. A report from Fitz Lee dated 3:30PM today, from the S side of the Chickahominy says he can discover as yet no indications of a move of the enemy by his left flank. Very respt. your obt. servt. 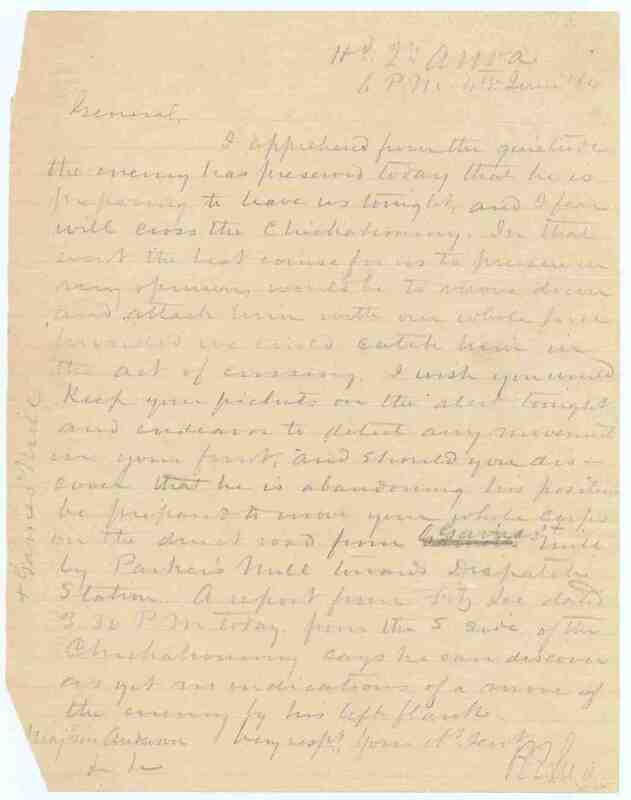 This entry was posted in Southern Historical Collection and tagged Battle of Cold Harbor, Chickahominy River, Cold Harbor, dispatches, Richard H. Anderson, Robert E. Lee, Virginia. Bookmark the permalink.